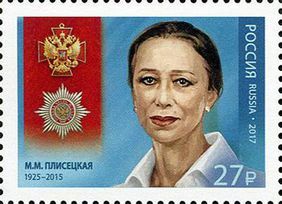 The post stamp represents the portrait of Maya Plisetskaya and the Order of Merit for the Fatherland. The value of the post stamp is 27 Russian Rouble and the size is 42 to 30 millimetres. The print run is 280 thousend pieces. Soon the post stamps shall be available in all branches of the Post of Russia throughout Russia. The chief of the ballet company of the Bolshoi theatre Mahar Vaziev and the managing director of the Moscow branch of Post of Russia took place at the presentation ceremony. “Today is a very important event for the Boslhoi Theatre and not only because the Maya Plisetskaya is a great Ballerina, who made a great contribution to the promotion of Ballet worldwide. There is hardly a person who has never head the name of Maya Plisetskaya. All ballerinas who are preparing to dance the role of Carmen take a DVD with the recording of the Maya Plsietskaya dancing this role. Her art of dance is still very modern. It is great honour for all of us to present this stamp.” – so Vaziev.